Most tourists come to Inner Mongolia to see 2 main attractions – the Grasslands and the Desert. While there are a number of Grassland options e.g. 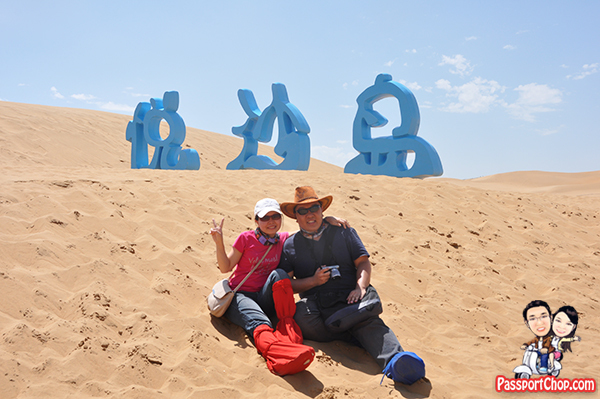 Xilamuren Grassland, the key desert attraction in Inner Mongolia is 响沙湾 Xiangshawan Desert. Xiangshawan Desert goes by many English names i.e. Singing Sand Ravine, Resonant Sand Bay or Resonant Sand Gorge. You will notice that all the names have to do with sound – that’s because of a unique natural phenomenon where the sand at 响沙湾 Xiangshawan Desert makes interesting echoes which varies according to weather and how you walk on the sand e.g. 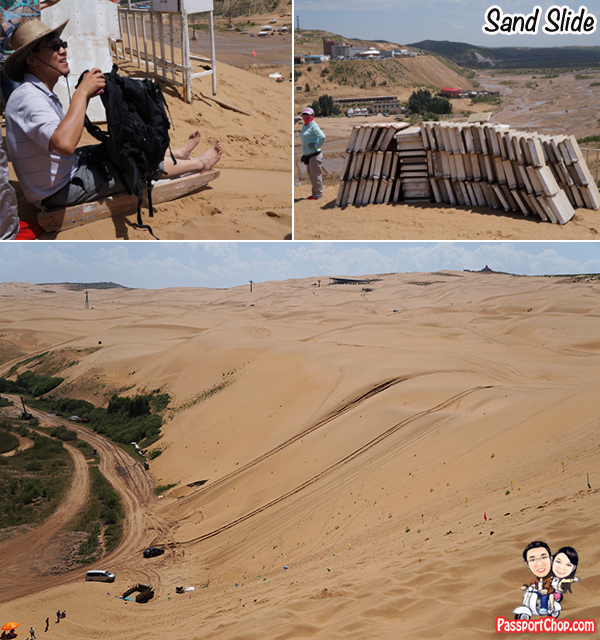 when sliding down from the 90-meter-high, 45-degree sand dunes of Xiangshawan Desert 响沙湾, one can supposedly hear the sound of car and aircraft engines! It is also said that the sand also produces a light “shhhh” sound as you walk on it. However, it is very difficult to hear such sounds today as 响沙湾 Xiangshawan Desert has become quite crowded and noisy with tourists. No one can explain this strange phenomenon – not even scientists/researchers studying this sound. There have been quite a number of folk stories on this sound – some say that a Tibetan lamasery was located here and it was suddenly buried in sand (together with all the lama monks who were chanting when that happened) by a sandstorm so it was thought that the sound was produced by the lingering spirits of the lamas who are still chanting! Xiangshawan is located in Dalate-Banner, 45 kilometres from the city of Baotou (a 1 hour 30 minutes drive away). The best period to visit 响沙湾 Xiangshawan Desert is during early spring or autumn (or late summer). Do note that summer and winter temperatures can be very high (85°F or 30 degree celsius) and low (2°F or -16 degree celsius – yes MINUS 16 and you might even be able to see snow-capped sand dunes!) respectively. We visited during late summer (mid-August) with Shangri-La Baotou Inner Mongolia Experience and the temperature was manageable. 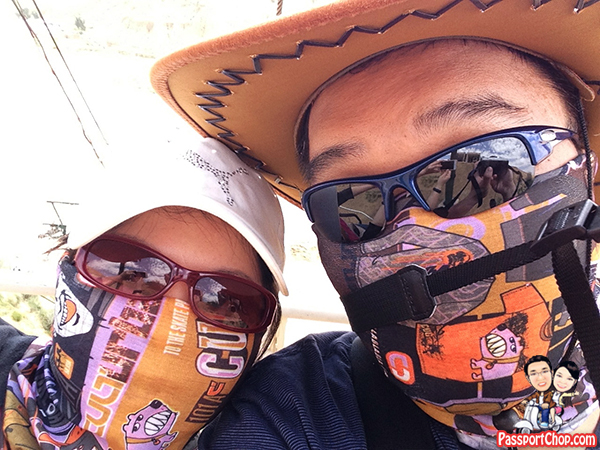 The picture below is pretty much what we looked like during our exploration of 响沙湾 Xiangshawan Desert – the desert sand is very fine; we bought a scarf that can also serve as a face mask (available for purchase at about RMB 10 at the tourist souvenir shop just before you take the cable car across to the desert – bargain hard) to protect us from inhaling any sand in case of strong winds at the dunes. The scarf can also extended to protect any exposed skin area e.g. neck from sunburn. Wear sunglasses and apply lots of sunblock and you should be well-protected from the sun. Buy a hat too (about RMB 10 – RMB 15 – bargained-down prices) – preferably a cowboy hat which offers “all-round” protection! Bring snacks and lots of water too. Food and water are available for sale within the desert but expect to pay quite high prices for it. Our attire for our tour of 响沙湾 Xiangshawan Desert. 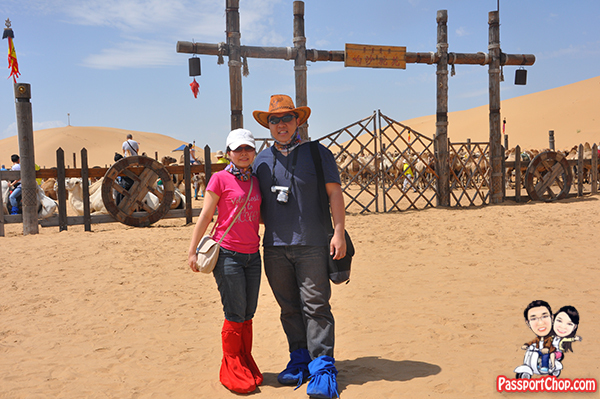 Notice the colorful cloth wrapped around our shoes – these are sand socks 沙袜 and are meant to prevent sand from getting into your shoes. Rental of sand socks cost RMB 10 and is available right after you get off your cable car ride to the desert. You must return the sand socks at the same location – right before you take the cable car back to where you started. The ticketing counter, carpark area is separated from the main sand dunes of 响沙湾 Xiangshawan Desert by a valley – you can choose to take a cable car ride across the valley to the desert or walk up and down the valley (i recommend you take the cable car so there is nothing much to do on the valley and the valley floor can be quite muddy). Tickets 门票 to enter 响沙湾 Xiangshawan Desert cost RMB 80; with the inclusion of return cable car ride 来回缆车, the total ticket cost will be RMB 120 (an additional RMB 40 for the cable car ride). We have been to the Sahara Desert at Morocco – the tour comprised a long camel ride to the middle of the desert where there was a Bedouin campsite and the tour group would sit around a campfire for dinner – it was a quiet and yet humbling experience to be in the middle of the expansive desert. 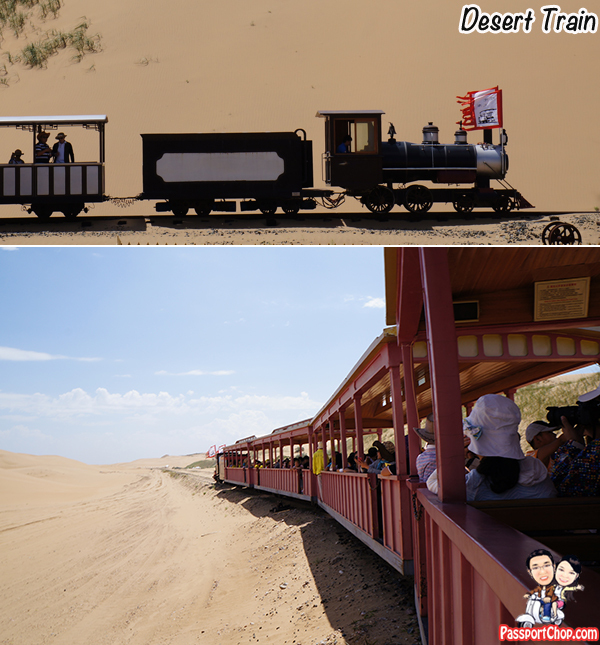 But expect no such experience from going to 响沙湾 Xiangshawan Desert – the whole desert area is resort-like and dotted with many different activities e.g. 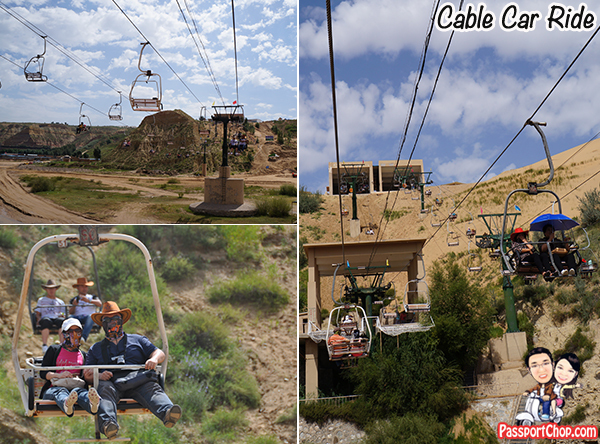 all terrain vehicle (ATV) rides, camel rides, ziplines and sand sliding – lots of fun things to do but do note that ticket prices for all these activities are not included with your RMB 80/RMB 120 tickets! You can choose to take each activity ala carte or purchase a 响沙湾 Xiangshawan Desert Activity Package Ticket 沙漠活动套票 for RMB 280. 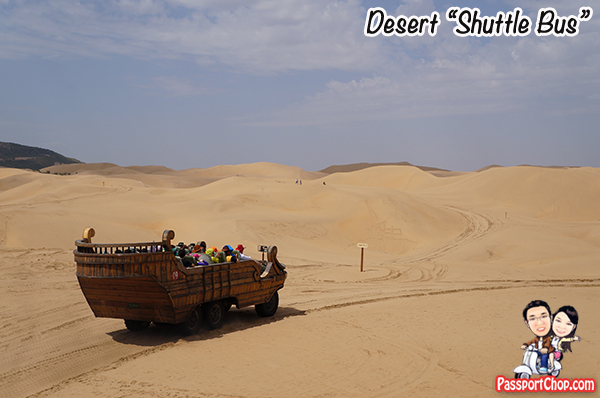 The ticket includes the following activities – Desert “Shuttle Bus” (or as the Chinese name suggests The Car that Rides the Sand Dunes), ATV rides, desert volleyball, desert football/soccer, camel riding, Ordos wedding performance, sand sculpture park, desert sightseeing train. The following activities are not included with the RMB 280 沙漠活动套票 – entrance tickets, cable car tickets, water park, golf, children’s playground, tickets to watch acrobatic and dance performances. 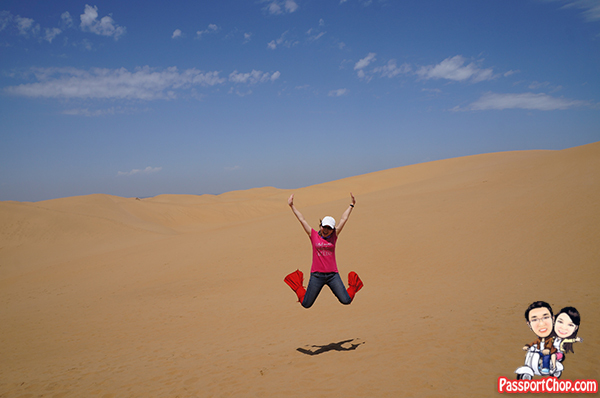 With so much to do at Xiangshawan Desert, it is not a surprise that this attraction is fast becoming one of the most visited sights in China – it has also been referred to as the Desert Disneyland 沙漠里的迪斯尼! The desert activities are spread out across 3 desert “islands” – the area where you alight from your cable car is known simply as 响沙湾 and the other 2 “islands” are 仙沙岛 and 悦沙岛. To get to these “islands”, you will have to rely on the desert “shuttle bus”. These are open-top buses shaped like a boat to “ride the wave” as its Chinese name suggests. Tickets for these shuttle buses are sold separately from entrance tickets – alternatively, you can get the 沙漠活动套票 which is all-inclusive. There are lots to do at 仙沙岛 – even for free e.g. playing the swings in the desert – there are a number of rows of swings here which you can play with for free! The following activities described for 仙沙岛 are non-exhaustive – there are lots to do here – there are also restaurants (but reviews online had stated that they served overpriced bad food!) and plenty of shelter (to hide from the hot sun). 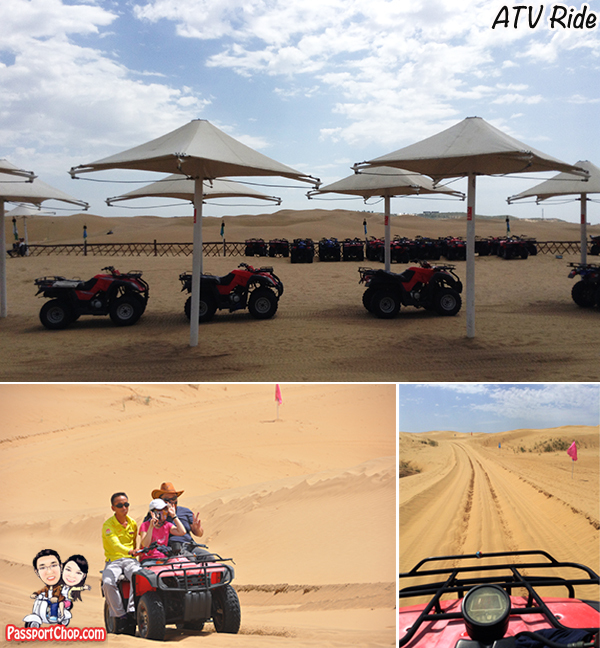 The ATV ride was a quick ride around a pre-determined route along the sand dunes – the ride is quite short (less than 5 minutes) and fast; you will be driven by a staff member and all you have to do is enjoy the warm breeze and pose for photos! Included with the Desert Activity Package Ticket. Once you are done playing at 仙沙岛, you can take the camel ride to the next “island” – 悦沙岛. 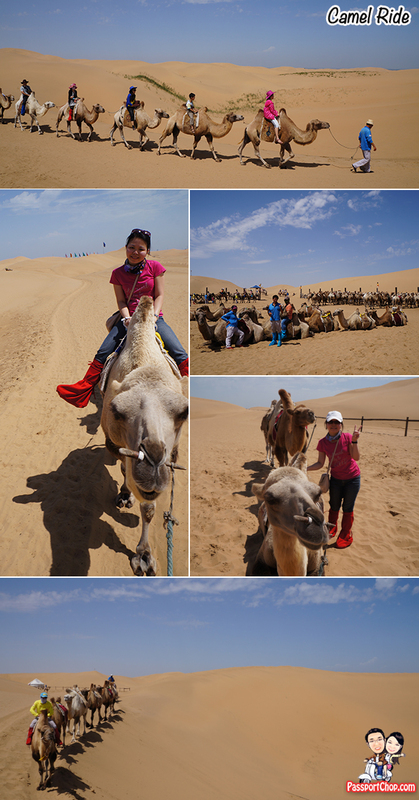 Do note that this is a one-way trip (if you have bought the desert activity package ticket, it only covers one-way camel ride; to purchase the camel ride ticket separately will cost you about RMB 160). The camel ride lasted for about 15 minutes and the pace is slow so it is quite safe. 悦沙岛 is known for its water sports facilities as well as the sand sculpture park. This is also typically the last “island” to check out before visitors take the desert sightseeing train to one of the 沙漠冲浪车 Desert Shuttle Bus which will in turn bring you back to where you started. If you would like to slide down a 45 degrees incline sand dune, you can do it just before you board the cable car back to where you started. This looks scary but it is actually not that bad – you can control the speed at which you slide down by “braking” i.e. put your hands in the sand – it is not painful as the sand is quite fine. 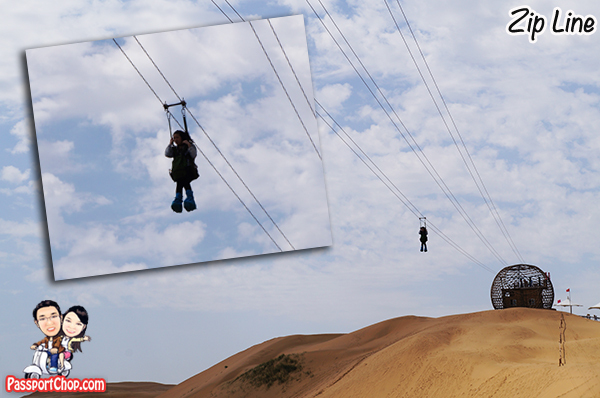 The sand-sliding activity cost RMB 20. I think the more scary part is climbing back up the slope when you have reached the bottom. I recommend doing this activity towards the end of your day at Xiangshawan – you can then climb up to the cable car station just before the final station at 响沙湾 and take the cable car back from there i.e. you only have to climb only half the slope! 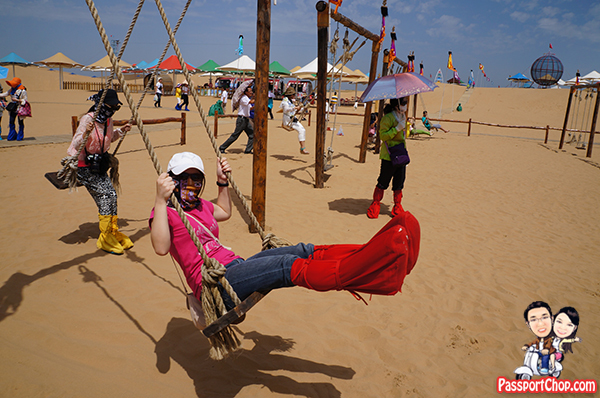 With so much activities to do at Xiangshawan, it is not surprising that the Xiangshawan Desert 响沙湾 is also known as the Desert Disneyland! For more info on Xiangshawan Desert 响沙湾, please see: http://www.xiangsw.com/English/index.php. If you can read Chinese, you will be able to find more information on the Chinese version of the website. The Grassland Experience packages are valid from 15 June to 15 September each year for two people sharing one room. It includes all accommodation, meals, transportation and admission fees. Reservations are subject to room availability. For more information and for reservations, please contact the hotel’s travel specialist at (86 471) 332 8888 or visit www.shangri-la.com. Hello. Good day to you. Is it advisable to come from Beijing directly here in Bautao then go to Hothot? Thank you.